1. 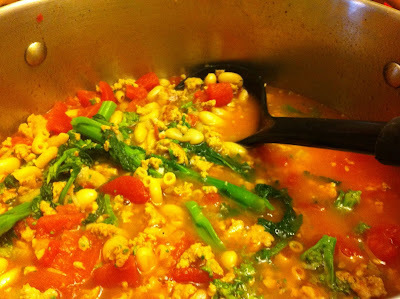 In a soup pot, bring a few inches of water to a boil, salt it, add the broccoli rabe cook for 5 minutes. Brain and plunge into a bowl of ice water, drain again. 2. In the pot heat 2 tbsp EVOO over medium-high heat. Add the sausage, break up the meat and cook until browned. Add the onion and garlic and cook to softened, 5 minutes bass the stock, cannellini beans, tomatoes and 1 cup water, season with salt and pepper. Cover the pot and bring to a boil. Stir in the pasta, lower the heat and simmer until al dente, 8 minutes. Turn off the heat and stir in the broccoli rabe. Top the Stoup with romano and a drizzle of EVOO. So one thing you should generally know is that I will usually make a recipe according to the directions the first time and thereafter I will make modifications that either are closer with my preferences or deal with availability of products or cost. 1) Broccoli Rabe -> is used this for the very first time an I actually had to google how to prepare the Broccoli Rabe. It was rather simple - treat it like asparagus, you have to break/cut off the bottom portion of the steam. I found that the steam would naturally break where after the tough part. I also found that generally you need to blanch it as the recipe calls for before using it. I have broccoli in my house routinely (my daughter loves her veggies particularly broccoli - so in the future I would skip buying broccoli rabe and use regular broccoli. This would help reduce the time it took to prep this meal and also on the extra ingredients that I need in my house. So I would skip the first step of boiling the water and then in the last 5-8 minutes I would throw in the fresh broccoli heads into the stew. 2) This called for spicy sausage however, because I was already buying sweet sausage for another recipe this week I just used a mild Italian sausage for this recipe and I found it was great. I am not sure if I would have liked it with the spicy sausage and I am not sure that the short person would have eating it. 3) Cannellini beans - again I have to send my love to google and wikipedia - this is white kidney beans :) I used the PC Blue menu white kidney beans with no salt and then rinsed them well.